Coming to Mon Hue in this occasion, parents need not to wonder which dish should order for your kids! The restaurant has available FREE servings for the children and the reward cards, redeem for many extremely lovely gifts! 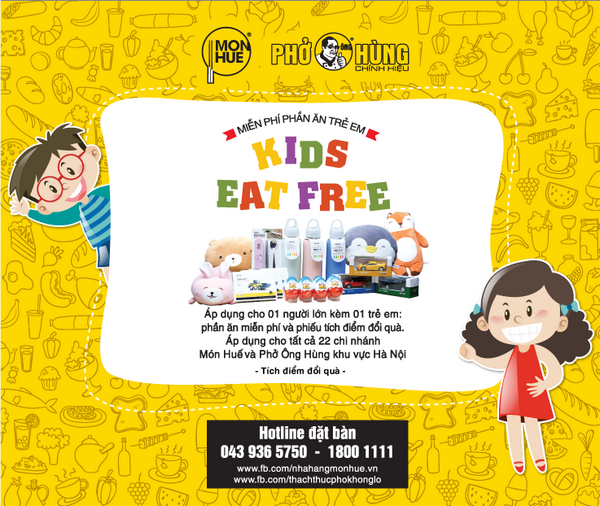 Offering free kid meals worth 55,000 VND for the guests who use service at the restaurant when accompanying with children. Area: Mon Hue in Hanoi. - For children below 1m3 height. - Apply all days of the week, not applicable on public holidays. - Apply for a cash payment, visa/master card. - Do not apply to customers paying by card, Prepaid Card, Vouchers. - Apply for guests who dine in the restaurant, does not apply to take away and delivery. - Cannot be converted into cash or gift vouchers. Please choose 1 gift corresponding to the point scope. Mon Hue Restaurant is delighted to serve you! Wish you have lots of fun in the holidays.